Just about a year after one of the strongest-ever El Nino events ended in 2016, there is a possibility of another later in 2017, though not of the same strength. What is the significance of El Nino? El Nino refers to an unusual warming of waters in the equatorial Pacific Ocean off the coast of Chile and Peru. It is known to impact weather events across the world, resulting in excessive rainfall in some areas, while causing dry spells in regions like India, Indonesia and Australia. In India, an El Nino event is strongly linked to suppressed rainfall in the monsoon season. The droughts of 2014 and 2015 were blamed on one of the longest and strongest El Nino events ever recorded, nicknamed “Godzilla”. El Nino events have a 3-5 year cycle. El Ninos are tracked very closely by Indian meteorologists, especially in the run-up to the monsoon season during which India gets about 75% of its annual rainfall. Global climate models are predicting a 50% chance of a “weak” El Nino developing in the Pacific Ocean in the latter half of this year, most likely after August. Over the past 35 years, El Nino events happened in 1972, 1977, 1982, 1987, 1991, 1997, 2002, 2009, 2012, and 2015. El Ninos have returned after a gap of 2 years earlier, and sometimes they have not happened for 7 years at a stretch. Never before in the last 40 years has the El Nino returned so soon. 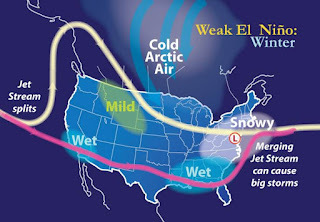 In any case, predictions of El Nino events made in March and early April are not very reliable due to what is known as the “Spring Predictability Barrier”. The El Nino phenomenon is in the process of transition during this time of the year; besides, it is always tougher to predict a weak El Nino than a strong one. What are the chances of El Nino this year? Australian Bureau of Meteorology in its latest El Nino outlook said that while current conditions in the Pacific Ocean continue to be “neutral”, there was “around 50% chance” of an El Nino developing later this year. The Bureau said this chance was “twice the normal likelihood”. International climate models suggest the tropical Pacific Ocean is likely to continue warming in the coming months, though in recent weeks some models have reduced the expected extent of warming. Five of eight models indicate that sea surface temperatures will exceed El Nino thresholds during the second half of 2017. Scientists at the India Meteorological Department believe that an El Nino, if it develops any time after August, is unlikely to have much of an impact on monsoon rainfall. But as the “Godzilla” El Nino showed, suppressed rainfall is not the only way the phenomenon influences weather in India. The winter of 2015-2016 which followed after El Nino was unusually warm, with were 5-8 degrees Celsius above normal in many parts of the country during January. If an El Nino event does reappear this year, India could be looking at another warm winter.